I'm a bit tired today and was wavering about writing a post, but what did I decide? Ha! You already know. But for once in my bloggy life, I'm going to get straight to the point. 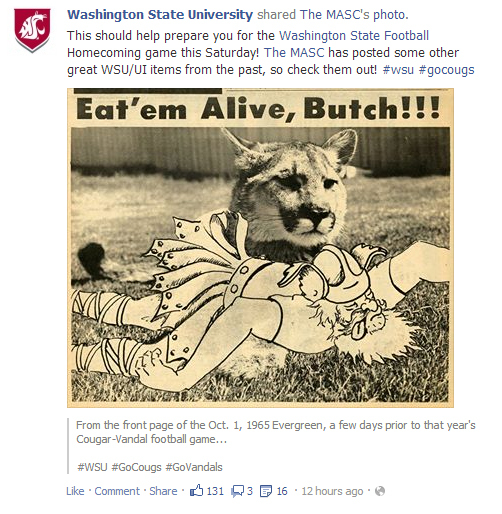 Today I'm giving props to Washington State University for their fantastic use of archival material. Technically, credit belongs to The MASC, WSU's library. So, so, so awesome that a school library is not only embracing social media like this but generating some amazing content. You rock, MASC! Vandal. It's what's for dinner. The University of Idaho is located just across the state-line from Washington State University, and the schools have had a long-running rivalry for more than 100 years. The two schools play each other in football this weekend, and this fun piece from the archives serves as a perfect way to give people a laugh while promoting the game. It received a lot of shares, both from the MASC's original post and from WSU's re-post. You could never get away with creating something like a Cougar eating a Vandal alive in today's overly sensitive, risk averse, social media firestorm society, but the hilarious (albeit sometimes cruel) game promotions of yesteryear are absolutely fair game in our #throwbackthursday world. It's fun, it's relevant, it's collegiate, it's a more than a bit off-the-wall, and it's a wonderful use of university archives. As an aside, one thing I've noticed from old promo items from back in the day is how delightfully aggressive they are with rivalries. My co-worker has an amazing button from 1961 that shows Wally Pilot (UP's mascot) stomping an Oregon Duck. A quick Google search turns up something similar from 1963, except this time Wally is bouncing an Oregon State Beaver. Chances are, your school's archives will have something similar for your rival... why not see if you can track something down and dust it off before the next big game? I guarantee you your followers will absolutely love it, and it's always fun to get away with something using archival material that you could 100% never get away with otherwise. Thanks for the fun throwback, WSU. Go Cougs! Sep 18 Music at Midweek: Go!